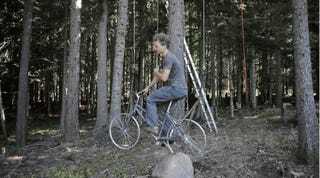 The bicycle-powered treehouse elevator is exactly what it sounds like. And yes, it is spectacular. Almost definitely incredibly dangerous, given the risks if anything should fail mechanistically, but spectacular. I'll admit it doesn't take much to impress me when it comes to treehouses. Growing up in Southern Arizona, I had access not to lofty, load-bearing branches, but state-protected saguaro cacti. The nearest thing I ever had to a treehouse was a shack made of 2x4s that my friend's dad had nailed together on the side of their property. It was situated on a steep, rocky hillside overlooking a wash. This lent our little hut the illusion of height, but all the childhood imagination in the world couldn't keep us from recognizing our "treehouse" for what it really was: a dusty hill-shanty. And yet, I think we can all agree that a bicycle-powered treehouse-elevator (henceforth known as the BPTE) is easily one of the coolest things to happen to arboreal living since the dawn of ladder rungs and slide rails. Ethan Schlussler, who engineered the system, clearly agrees. Just look at the expression on his face. ONLY MORE THAN ANYTHING IN THE WORLD, ETHAN. Though, as someone who finds even five feet of air between structure and solid ground genuinely exhilarating, the thought of pedaling my way thirty feet straight up is enough to make my intestines curl up and whimper. I mean, what if a cable snaps? Isn't this rig kind of dangerous? Then again, maybe that's the point. 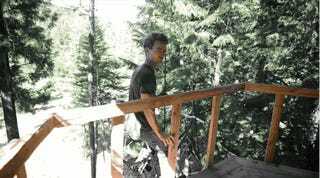 As children, most of us probably recognized treehouses as inherently dangerous, but the safety of solid earth is easily given up when weighed against the freedom and general awesomeness of leisure-at-moderate-altitude. Perhaps a BPTE is just the logical extension of that mindset. Sigh. You feel that? That faint twinge in your chest urging you to take the rest of the day off work and reclaim some of that childhood sense of wonder that used to come bundled with summertime, bathing suits, warm nights and – if you were lucky – treehouses? Yeah, we feel it, too.